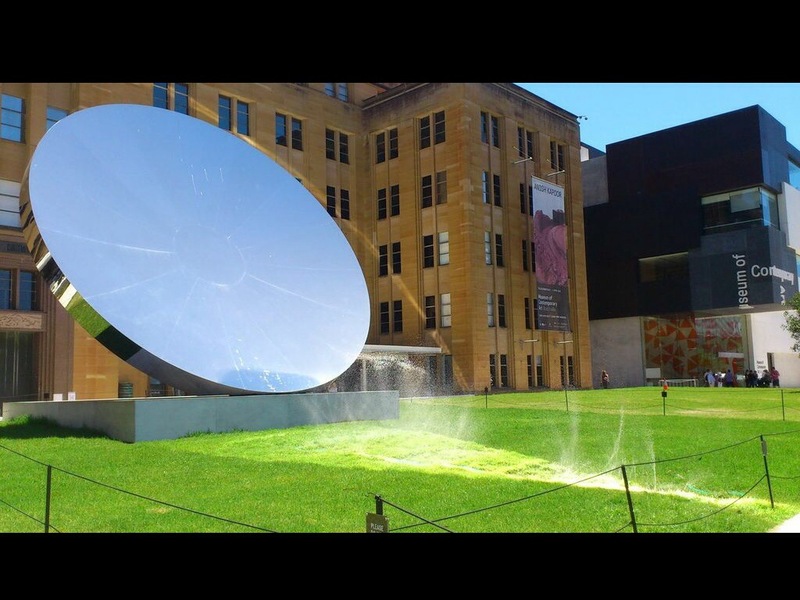 In 2012 Sydney’s Museum of Contemporary Art held an exhibition showcasing selected works by Anish Kapoor. He manages to create some amazing visual effects in his art and is apparently often driven / informed by philosophical ideas – so I enjoyed the pieces… But outside was something truly remarkable. The ‘Sky Mirror’. First exhibited in 2006, the great arcing mirror reflects the skyline and buildings behind and above the observer. But I didn’t know this when I saw the installation (I looked up the details when I got home). You may notice that the object is fenced off – you could not actually stand in front of the disc and experience the ‘Sky Mirror’ effect. You may also notice steam rising from the ground. This is because hoses were left running on the burnt grass. Kapoor’s beautiful object also has the same concave, reflective shape as Archimedes’ ‘Death Ray’ (allegedly first exhibited around 212 BCE). Coupled with the Australian summer sun, the lawns outside the MCA suffered the scorching fate of Roman warships. Like a child with a magnifying glass the MCA curatorial team delivered all the wonder and absurdity I love to find in the world, all within a meagre 35-foot diameter (and a patch of lawn).